Ferrovial continues its efforts to offer services and infrastructures that respond to challenges such as climate change, water footprint management, the energy crisis, the reuse of waste and the loss of biodiversity, to create value by lessening its environmental impact and to discover new business opportunities. Ferrovial offers services that help reduce the environmental impact of users and customers alike. The company is aligned with the global agenda of championing and promoting a low-carbon economy. It actively seeks to minimize the use of natural resources when going about its business. Ferrovial’s climate strategy forms part of the company’s wider business strategy. Matters relating to climate change has been analyzed and discussed by the Board of Directors and the Management Committee. The task of implementing the climate strategy is entrusted to the Quality and Environment Committee, which comprises the heads of quality and environment officers of the various business units. The strategy comes to life through the development of innovative products and low-carbon services, through the company’s commitment to reducing its carbon footprint and to collaborating with stakeholders when transitioning toward a low-carbon economy. During 2018, the company conducted a review of the risks and opportunities associated with climate change across all its business units worldwide, following the recommendations of the Task Force on Climate-related Financial Disclosures (TCFD). This analysis covers three different scenarios based on the degree of implementation of policies to combat climate change. They are known as the current policies scenario, the new policies scenario and the sustainable development scenario, the latter being the one that considers an increase of the temperatures with respect to preindustrial levels of 2º or less. The study reveals that Ferrovial faces various transition risks due to policy change and physical threats in the short, medium and long run. The business opportunities detected relate to the range of possible solutions in the fields of water, energy efficiency, urban mobility, circular economy and conserving biodiversity. A quantification of the economic needs linked to these opportunities has also been carried out. The duty to calculate and report the carbon footprint extends across the entire company and covers all business units and subsidiaries. The calculation method is based chiefly on the GHG Protocol (WRI&WBCSD), which is the most internationally accepted approach, while also adhering to ISO14064-1 standards. The market-based method was used to calculate scope 2. By 2030, the target approved and endorsed by SBTi is to reduce scope 1 & 2 emissions in absolute terms by 32% and in terms of intensity by 42.9%. 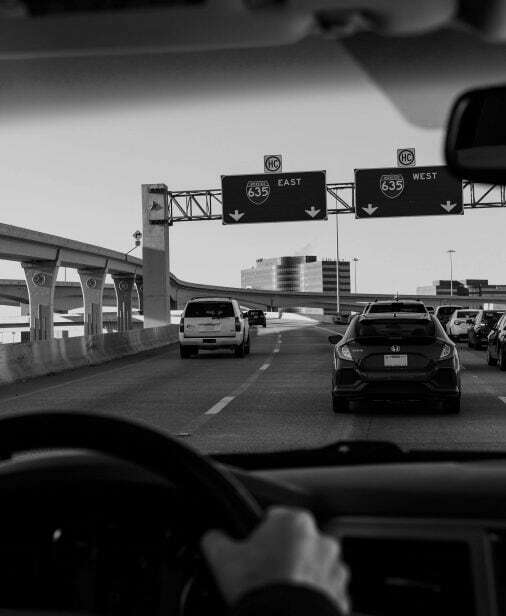 In 2018, scope 1 & 2 emissions were reduced by 54% in relative terms of intensity and by 14% in absolute terms since 2019, which reflects Ferrovial’s commitment to the roadmap established for the fulfillment of the established objectives. SCOPE 1: GHG from sources that are owned or controlled by the company. They mainly come from the combustion of fuels in stationary equipment, diffuse emissions, channeled and fugitive emissions. SCOPE 2: GHG because of the consumption of electricity purchased from other companies that produce or control it. SCOPE 3: GHG issued indirectly by Ferrovial attributable to the products and services acquired, or due to the use of products and services produced by third parties. A progressive reduction of absolute emissions can be observed, in general terms, because of the different initiatives to promote energy efficiency, sustainable purchases or purchase of renewable energy in each of the divisions. Because of the nature of the infrastructure projects undertaken by Ferrovial, with an average concession life of 41.9 years, and because climate change legislation is in context flux, the company has developed a corporate tool that weighs up the financial risks associated with this aspect of its projects. The tool uses a shadow pricing approach to consider variable prices for a ton of carbon over different time horizons and across different regions and project types, quantifying the potential economic risk facing the projects for which the company decides to use the tool. The tool helps reduce the inherent uncertainty associated with legislation relating to climate change and provides a realistic quantification of the possible costs associated with each project. Ferrovial maintains an active position with its most relevant stakeholders, particularly those that are or may be involved in the main climatic risks of the company’s business activities across the globe. Ferrovial is involved in various think tanks and influence groups at European level to discuss and predict the future of the economic and environmental agenda for the 2030 and 2050 horizons. Notably, these include the Corporate Leaders Group (University of Cambridge Institute for Sustainability Leadership) and the EU Green Growth Group (platform comprising representatives from the business world, members of the European Parliament, governments and commissioners). In the realm of climate innovation, Ferrovial has been a co-partner of Climate-KIC, the largest European initiative focused on mitigating and adapting to climate change. In Spain, Ferrovial chairs the Spanish Green Growth Group, which promotes public-private partnerships to make further progress in mitigating and adapting to climate change, decarbonizing the economy and championing the circular economy. A manifesto was signed in 2018, together with 35 other Spanish companies, to activate the energy transition and a conference titled “Opportunities of the energy transition for the Spanish and European economy” was organized in collaboration with the European Alliance to Save Energy. The company is a member of Fundación Empresa y Clima, a strategic partner in the #PorElClima Community, which promotes the Spanish Platform for Climate Action supporting public-private partnerships. It is also an observer member of the United Nations Framework Convention on Climate Change (UNFCCC) and belongs to the Climate Change Cluster promoted by Forética. Ferrovial works hard to incorporate the principles of the circular economy in all its processes, products and services by reducing the use of non-renewable natural resources, reusing waste as raw materials, recycling, incorporating eco-design criteria and raising public awareness. Zero Waste to Landfill project, to eliminate the volume of waste sent to landfills. Developed by Ferrovial Services in partnership with Ford. Transforming biogas obtained from waste treatment into biomethane at waste treatment plants. Developing long-lasting pavements by improving bitumens and asphalt binders. 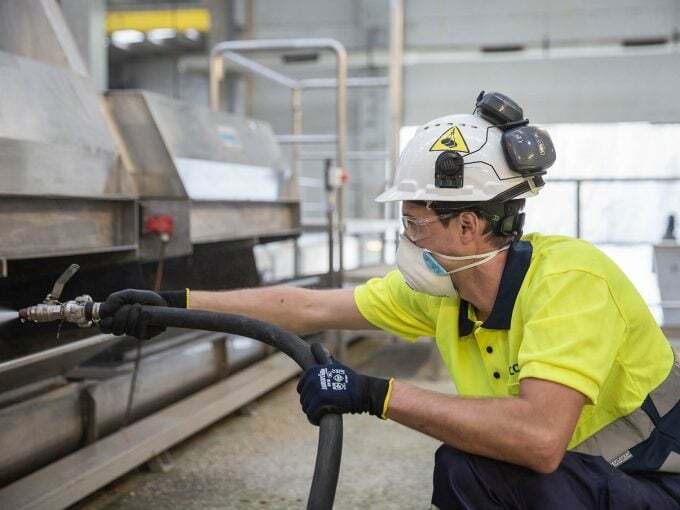 Obtaining recycled fibers from waste construction material through the HorBran Project, to encourage the use of recycled materials in construction. Obtaining plastic biopolymers of renewable origin from wastewater treatment sludge, within the framework of the DEMO B-PLAS project. Under the “Ferrovial, Natural Capital” program, the company undertakes different projects related to biodiversity with the aim of achieving zero net loss of biodiversity in its projects. The company is working alongside Creando Redes and Climate Kic to develop a methodology that will allow us to quantify impacts on the ecosystem. The objective of all the projects arising out of this program is to gear company business toward minimizing the impact of its activities following the principles of the mitigation hierarchy, while also looking for ways to improve the ecosystems in which the infrastructure lives. During 2018 the company has been working in the development of a biodiversity initiatives catalogue, where the detail of them will be available. It is also worth noting that Ferrovial has collaborated with the Spanish Business and Biodiversity Initiative, which is coordinated by Fundación Biodiversidad and which works with 22 large companies, important business and conservation bodies to integrate biodiversity into the business sector. This partnership led to the publication of the Practical Guide to Ecological Restoration. Meanwhile, the company has been undertaking ecological restoration and circular economy projects in partnership with Fundación para la Investigación en Etología y Biodiversidad and it signed a commitment against deforestation with WE MEAN BUSINESS. In 2015, Ferrovial devised a methodology for calculating and reporting its water footprint, which guides and shapes the company’s water management strategy based on estima-tes and consumption standards in processes. The method allows it to identify the value of water to the processes and to the environment, taking due account of its availability and quality, as well as the balance of the ecosystems in which the resource is located. Ferrovial has a Water Policy, in which it recognizes water as a limited and irreplaceable natural resource as well as a fundamental human right. The policy expresses the company’s firm commitment to using water responsibly and sustainably, integrating it under the principles of the circular economy and promoting access to clean and healthy water to the populations of developing countries. 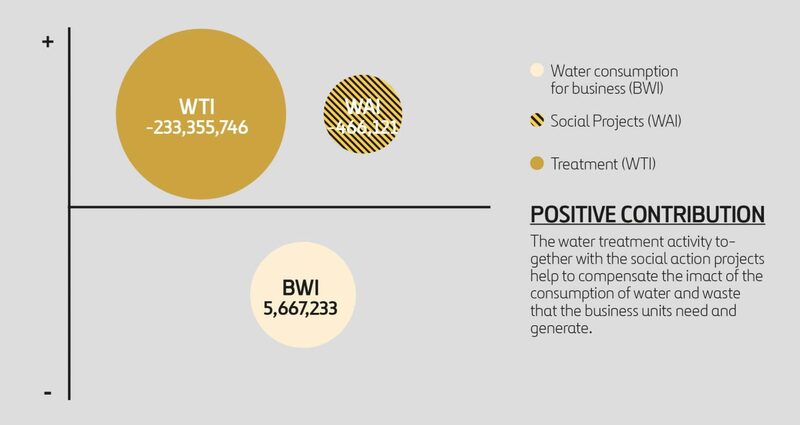 The water footprint reveals that water consumption by the company’s business units is parcial offset by the water treatment business, as well as the social action projects undertaken through the Social Infrastructure Program, which provide access to drinking water for communities located in developing countries. Ferrovial’s business activities generate a number of impacts around the vicinity of its projects and facilities, including emissions into the atmosphere, effects on the surrounding biodiversity, earthwork and the generation of waste. The company implements corrective actions to help minimize or even offset these impacts. For instance, reusing earth on the construction site effectively eliminates the emissions that would otherwise be generated by having it transported off-site, while also ensuring the project’s better integration with the landscape. Ferrovial has set itself an 80% earth reuse target for 2020. A further highlight is the increase in the amount of recycled waste, which, under the principles of reduction, reuse and recycling, amounted to 2.3 million m³, some three times more than the previous year.